Your tour to Sweden will take you to a land of extraordinary nature: foaming rivers, dense forests, wild open spaces, and scenic shorelines. Above everything else, the country is full of life, history, and tastes, so it's is definitely a place worthy of exploring! The largest island in Sweden, Gotland, is the so-called Pearl of the Baltic which has become a real magnet for tourists. For its popularity, we can certainly thank Visby, the main town of Gotland, as well as a tiny neighboring country Faro. While Faro is full of various rock formations (raukur), fantastic beaches, it charms its visitors with tranquility. Visby attracts people for the opposite reasons, it is a former Viking settlement, a medieval town that is a Unesco World Heritage site that's full of energy and charm. It is often named as one of the best preserved ancient walled cities, and the only one like this remaining in entire Sweden! Hidden in a pine forest of Northern Sweden lies a magical city of tree hotels. 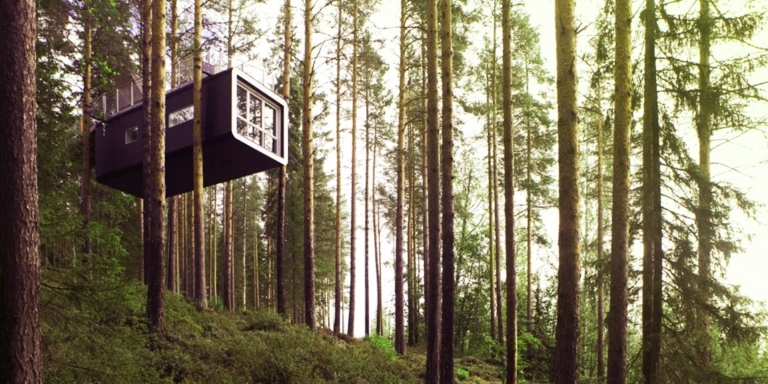 You can choose from various cozy Nordic tree houses, some of which are just mind-blowing. Can you imagine yourself sleeping in a gigantic bird’s nest Mirrorcube, or spending a night in a UFO spaceship, or a giant cabin? Well, everything is possible in Treehotel, where you can actually experience nature in one of the unique ways and be inspired by the surroundings no matter what season it is. We're absolutely positive that this experience could easily become a highlight of your vacation in Sweden. We will forgive you if you hadn't heard of this little slice of heaven called Lund. Hidden in the southern tip of Sweden, this university town could be easily named as one of the loveliest in the country. Dating back to 990, it one of the oldest cities in Sweden! Nevertheless, itis aging with beauty and is full of pulse and lively cafes. What not to miss? Lund Cathedral (Lund Domkyrka), the open-air museum (Kulturen), the Botanical Garden, Historical Museum, Holy Cross Church of Dalby (the oldest preserved stone church in Scandinavia), even a simple stroll is magical there. Lucky you if your tour to Sweden starts at the end of June, as you will get a chance to celebrate the longest day of the year with the Midsummer festival (between June 20 and June 26). It never goes without flower wreaths, folk dances and singing around the midsummer pole, as well as various rituals associated with nature. It might seem like a weird tradition, but it is definitely a fun one! You can find Midsummer celebrations all around the country, but if you're not sure which place to pick, we suggest you visit Vastergotland, the so-called heart of Sweden, or go to Dalarna, a place where you can truly embrace Swedish culture and feel like a Swede yourself. It is not difficult to see why "Vasa Museet" is said to be the most visited museum in Sweden, and, actually, in whole Scandinavia. This maritime museum houses the majestic ship "Vasa", which is the only preserved 17th-century ship in the world! But be sure it is more than a mere old boat, it was one of the world’s high-tech and most spectacular warships at that time, and a real artwork with hundreds of sculptures on it. Interestingly, the ship we see at the museum is 95 percent original, and that's all thanks to the Baltic Sea, whose cold waters had protected this treasure until 1961 when the ship was discovered and excavated. Set only a 30-minute drive from the Stockholm, Drottningholm is home to the private residence of the Swedish royal family. The grounds of this World Heritage Site are breathtaking, and you could easily spend a whole day there, visiting the Chinese Pavilion, parks and gardens, the royal theater. You will surely immerse yourself in rich history and feel the serenity of the land. You can even take a boat trip to get to Drottningholm Palace and make your trip even more enjoyable. If your Sweden adventure takes you anywhere near the so-called Swedish Lapland, don’t miss out on visiting Kiruna, a real winter wonderland. This small mining town is located in the center of the Aurora oval, and everyone knows that the further north you go, the better are your chances of catching the famous Northern Lights. But in Kiruna you can experience even more, starting from snowmobiling, dogsledding, to such unusual activities as reindeer sleigh rides or even snowshoeing. Kiruna is also home to one of Sweden’s most magical attractions - the Ice Hotel. We are sure that the sleeping on ice experience can easily become your most unforgettable lifetime adventure. We know that most probably your visit to Sweden will include Stockholm, but it just deserves to be on this list. During the tour of Firebird Tours visits to the famous Royal Palace, the Stockholm Cathedral, and the City Hall are all included. Yet the jewel in the crown is its Vasa Museum (see point 5) and the well-preserved medieval Old Town. If you wish to experience the untouched nature of Sweden, you simply cannot miss the unique archipelago in Stockholm with nearly 30 000 islands, which starts just in the outskirts of the city. You might have heard or even went to this Swedish-inspired coffee chain "Fika". But did you know that Fika is not a meaningless combination of sounds but an actual Swedish word? Swedes invented this word for the almighty coffee break, a ritual to take some time off during a busy day! Isn't it genius? When there, don’t forget to find a cozy coffee place. Even when traveling, it is essential to take a moment for yourself or dive into a pleasant conversation with your fellow travelers. Want it to be really authentic? Do it around 11, and don’t forget to grab a sweet cinnamon bun "kanelbullar". Swedes certainly love nature, and creating natural parks is one of the best ways to preserve and enjoy it. So it’s no surprise that there are more than 25 unique natural parks there! But if you can visit just one, this needs to be Sarek. Sarek National Park is definitely among the most spectacular parks in whole Sweden. It is situated in the alpine area, with mountains as high as 2000 meters (6562 miles), many streams, and mountain slopes. And if you want to stay there, there are two options: you can stay in a traditional cabin or choose to stay in an equipped tent. If you consider Sweden for your next getaway but still have doubts when to go, what to wear, or which sights to include to make it a trip of a lifetime, read this Trip Planner for Scandinavia and don't hesitate to contact our travel specialist. We can't wait to see you on one of our tours!